I hope to finish the final leg of this walk soon, so now seems like a good time to look over some of the ground that has been covered. 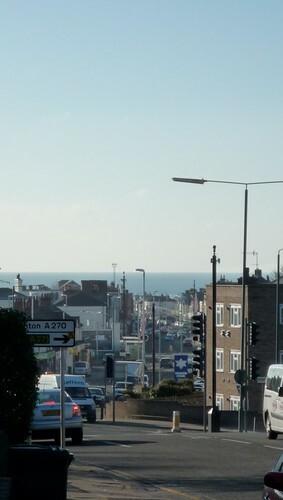 Starting in January 2008, I have walked from Southport Pier to Boundary Road on the edge of Hove, in 42 sections. 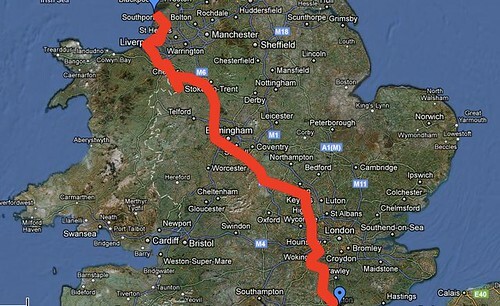 The shortest of these was around a mile crossing Liverpool, the longest 25 miles in Bucks. All that remains to do is the last few miles to Brighton Pier. The total distance covered will have been around 225 miles. A five-hour journey by car or train, which we have made so frequently that it has become routine, has been expanded into a three-year odyssey, full of mundane wonders. 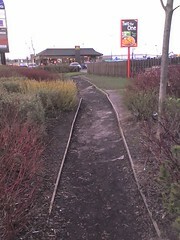 Constructing my own Long Distance Path as I went along, I have joined up my birthtown with the place I live now. Along the way I have walked along roads, paths, canals, rivers, bridleways, green lanes and, latterly, a couple of twittens. Like a rambling Dr Frankenstein I’ve stitched together a route from whatever material came to hand. Bits of official routes, named after Monarchs, Jubilees, Pilgrims, the Thames, the Downs (North and South) and so on, have been hotwired with more obscure footpaths to produce the lurching creature that is my unique journey. 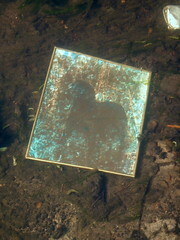 I have walked beside canals that have silted up, through paths overgrown with nettles, on a railway sinking into mud. All the time, unsuspected by me, my own internal channels were become occluded, arteries hardening with atherosclerosis. The treatment for this involved new bypass routes for blood and oxygen being created, skilled handiwork in a hospital right next to the route. The scope of my walking was reduced, initially to crossing the ward with ‘tottering old-man steps’, soon to five- and ten-minute excursions. After three months I was able to resume the interrupted journey. 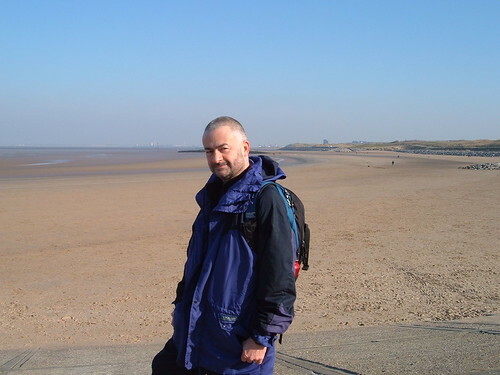 As well as the walk itself, there have been some sidetrips, including the now-famous exploration of non-existent Argleton as discovered by Mike Nolan. The Argleton post has had tens of thousands of views, whereas the unreliable travelogues I normally produce notch up mere tens. Bizarrely, it led to press articles and radio appearances, whilst Argleton has acquired a status as a minor myth, spawning at least one book and various websites. And now it is nearly done. The route bisects the country like an extended Boundary Road. I have worn out a pair of boots, though they are still serviceable. Currently they are standing on my parents’ patio, outside the back door, waiting for me to put them on for last miles of this trip. However this won’t be my last travel-and-writing project. Brighton Pier will be a lingam fertilising the ocean of possibility to create my next Quixotic quest… watch this space. 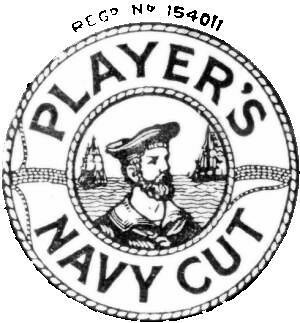 In Ian Fleming’s novel Thunderball, published in the year I was born (1961), the character Domino Vitali provides an interesting account of the origin of an iconic image: the sailor on the John Player Navy Cut cigarette packets. “Have you never thought of the romance behind this picture? You see nothing, yet the whole of England is there! Listen…This is the story of Hero, the name on his cap badge.” A career sailor from boyhood, “he went all over the world–to India, China, Japan, America. He had many girls and many fights with cutlasses and fists.” Rising in the ranks to become a bosun, he grew the famous beard and embroidered a picture of himself, framed by a lifebelt. Then, “he came back home on a beautiful golden evening after a wonderful life in the Navy and it was so sad and beautiful and romantic that he decided he would put the beautiful evening into another picture” featuring “the little sailing ship that brought him home from Suez” and “the Needles lighthouse beckoning him in to harbour”. Hero hangs the embroideries in the pub he runs, where one day a Mr John Player and two small boys, his Sons, see the pictures. The rights to copy them are acquired for the sum of a hundred pounds, and combined into one – the round portrait superimposed on the square homecoming picture, obscuring a mermaid – thus creating the image that has adorned Navy Cut packets ever since. As a child at Cheltenham Ladies College, Domino (at that time called Dominetta) carried the picture around with her, as a talisman, “until it fell to pieces”. This account could of course be made up – a tale within a tale. There are other origin stories. 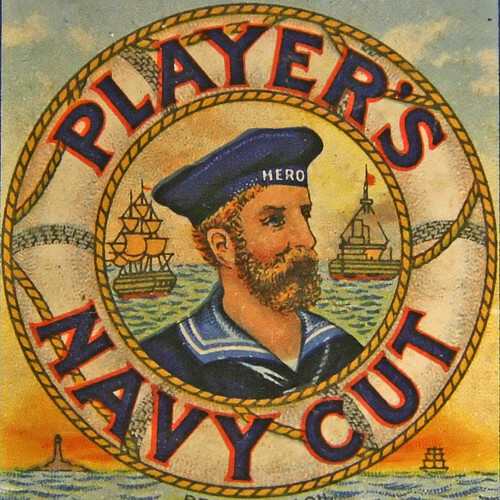 Various sources (eg Middleton, 2004) refer to a sailor called Thomas Huntley Wood, whose picture had appeared in the Illustrated London News in 1898, “whence it was borrowed for advertising purposes. A friend of Wood’s wrote to the firm suggesting payment of a fee of £15; Wood reduced this to a sum of two guineas ‘and a bit of baccy for myself and the boys on board’.” (The Man Who Sold His Face, in talent imitates, genius steals.) Wood lived in Lower Portslade, as far as I know until he died in 1951. Apparently he tired of the recognition and shaved off his beard. There are other claims for the original sailor, some made in the comments on a Guardian Notes & Queries column. Perhaps many places have a story of ‘their’ sailor who was used as the basis for this picture, like the countless local versions of Hindu deities, or the Madonnas in trees that appear throughout Europe. But as a Portslade man brought up on James Bond (of whom my dad approved on the basis that ‘the story starts straight away’) I’ll stick with Thomas Huntley Wood for reality, Domino Vitali (aka Dominetta Petacchi, Dominique Verval in the 1965 film, Domino Petachi in Never Say Never Again) for mythology. 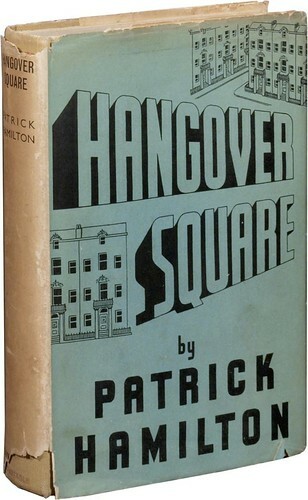 Twenty years before Thunderball, in the novel Hangover Square by Patrick Hamilton (1941) the protagonist George Harvey Bone suffers from a split personality disorder involving long amnesiac spells. In one of these he finds himself wandering an unknown street, and asks a passer-by where he is. Initially he mis-hears ‘Portslade’ as ‘Port Said’. 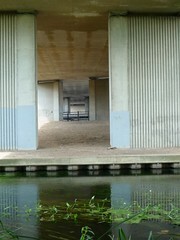 This scene highlights the disorientation of lost identity, and maybe also reflects the nature of the locale, as Portslade itself has been described as ‘a place with a dual character; a veritable ‘Dr Jekyll and Mr Hyde’ of a place’ (in Kipling’s Sussex Revisited, R. Thurston Hopkins, 1929 quoted in Green 1994.) 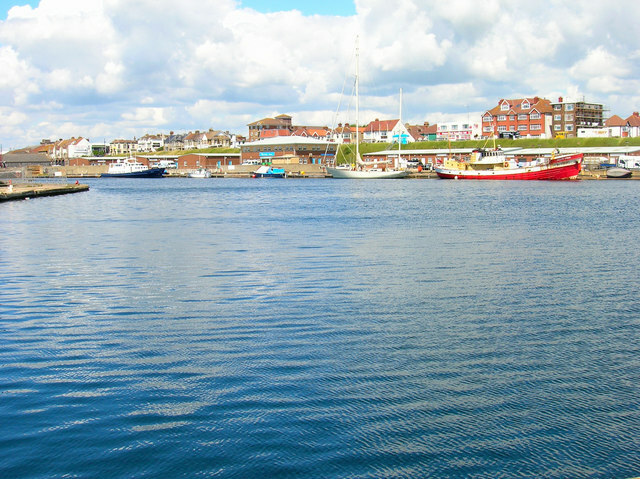 ‘Portslade Hyde is painfully brutal with its squalid water front and rows of grimy houses and shops, while Portslade Jekyll, a mile from the sea, is a benevolent spot and just as pretty and secluded as nine out of ten of the ‘guide book’ villages.’ . And healthy effects have been experienced. I have a picture postcard, postmarked PORTSLADE AUG 16 07. 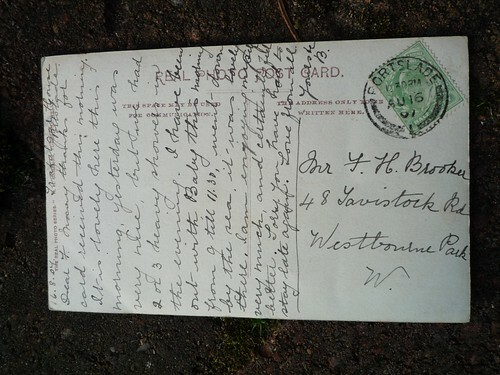 The sender was writing from Trafalgar House, another building a few yards from ‘my’ newsagents. “I have been out with Baby this morning from 9 till 11.30, went down by the sea, it was lovely there, I am enjoying myself very much, and certainly feel better” wrote ‘B’ to a Mr F. H. Brookes or Brooker, 48 Tavistock Road, Westbourne Park. I hope things worked out for B and Baby. Her postcard featured, incongruously enough, a picture of Orkney. 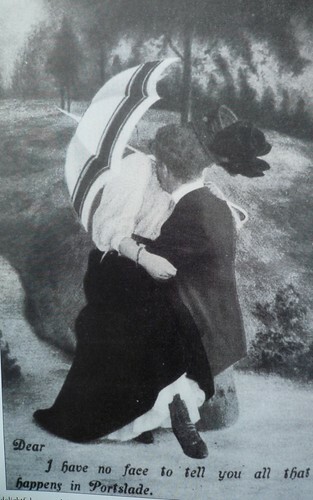 A year later, she would have been able to buy a postcard of Portslade itself, bearing an image with something of the surreal power of a Max Ernst collage, and an ambiguous, even terrifying caption: ‘Dear____ I have no face to tell you all that happens in Portslade.’ (From Middleton, 1997; ‘This delightful postcard dates from 1908.’). Over 100 years since the walk with Baby, three-score-and-ten after Hangover Square, half a century after Thunderball, three years after I started walking down from Merseyside, I arrived at Portslade, the ‘Home’ of this blog’s title, having walked some 300 miles, occasionally limping as like Domino I have one leg slightly shorter than the other (though given Ian Fleming’s penchant for giving characters physical flaws (which tend to make women/good characters more attractive, and men/bad characters more monstrous) this may have been an aspect of his fictionalisation of the actual events.) Along the way I walked around the perimeter of Pinewood Studios, where the film version of Thunderball and nearly all other Bonds was made, along with some other films about heroic orphans (Batman, the Supermans). A year ago today I underwent a heart operation, survived and became stronger. If I had recalled the Portslade crest at the time, I would have used it as a talisman of health and strength; the link with my distant home town would have been comforting. Perhaps subconsciously I did recall it; personal ley lines seem to join up all that happens, even as things transform into other things, names and faces change and talismans fall to pieces. I concluded the last bit of walking at Station Road (Hove), a street that has two names as it is also Boundary Road (Portslade). It is hard to say where one ends and the other begins; perhaps there is a line to quietly cross or perhaps both names inhabit the same road. Soon: the final walk to Brighton Pier. Walking Home to 50 will be back! The placename ‘Broadgreen’ has an attractive ring to it – perhaps denoting a wide common of some kind. 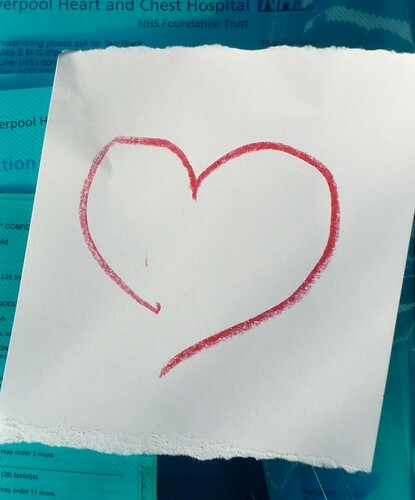 These days Liverpool’s Broadgreen is home to the hospital where, at the end of this month, I will be spending a few days having a cardiac bypass. 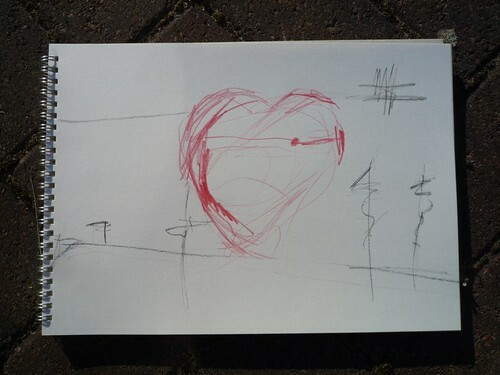 A pilgrimage along re-routed arteries; a mashup heart created to get me back on the road. Culmination of six weeks since being diagnosed: an experience probably less stressful than a tour of duty in a warzone; probably more stressful than a season in a pantomime, with some characteristics of both. Maybe more like unexpectedly finding oneself in the cast of a Mystery Play, in which the devils and angels keep changing places, the story seems familiar but doesn’t make sense, and the stage maroons are armed with live ammo. Snowdrops and snowflakes delivering body blows in a winter that won’t quit. Venous sabbatical. I am happy enough to be booked in to Broadgreen. It is an excellent hospital by all accounts and an outpatient visit yesterday was as pleasant as such a thing could be. And the location interests me. It is at the western end of the M62, and in a sense Walking the M62 begat Walking Home to 50. 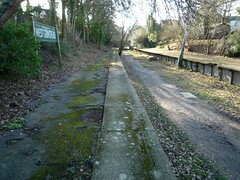 In fact, way back in 2008 on the third leg of the walk (Maghull to Liverpool) I walked right past the hospital, on the Liverpool Loop, a deep disused railway cutting. So this pitstop is right next to the track itself. Comforting, like being wired up to my own personal leyline, connected to places and people that matter, north and south, past and future. Of course, back then I had no idea. At the time, I may not even have glanced in its direction. So all you ramblers, bear in mind: when you look into the darkness of the trees lining your route, dreadful, marvellous things may lurk there. A future that will alter your heart. Nothing left to do now but go through with it. 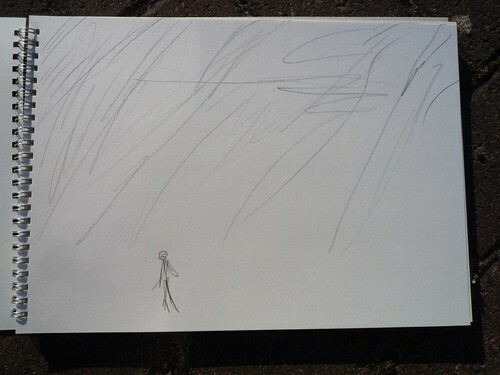 And hope: that it works, that soon I’ll be buoyed on a spring blood-tide, walking home. All my routes have unravelled and fearful (fearsome?) things must be faced. The angiogram I had yesterday revealed that I will need a cardiac bypass operation. This should happen in the next three months. This walking through middle age is getting hard. 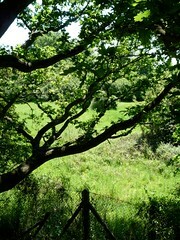 The days and miles of the walks I’ve done over the past two years seem poignant now, rambles in Eden. An operation and some weeks of convalescence will slow me down… but will it stop me walking the remaining 60 or so miles to Brighton? Actually, hearing people talk about bypasses, I expect to bound out of bed, walk the whole thing in a day and manually reassemble the West Pier on arrival. Failing that, even if I have to walk it in shorter legs I will get there. In the meantime this blog may be sporadic for a while. I’ve launched another one to set down my health-related journey in case it is helpful to anyone. For a long time now I’ve been pondering the best route to take for the last part of the walk. I could veer off into the southwest, strike the south coast and approach Brighton from the west. 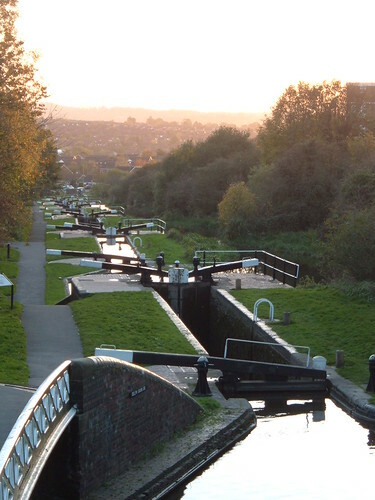 Or I could skirt London anticlockwise and end up arriving from the north close to the route of the M23. Or head straight through London and come in via Kent. Each has its attractions, pros and cons and today was the day I would decide. I left Great Missenden with some gladness. Despite its superficial normality, I had found this place to be sad and uncanny, rather like something from a story by Robert Aickman, or the phantom town of Argleton that has been all over the media recently. Hiking out through autumn paths, leaves cascading down through wild air, felt like escaping a strange impasse. I spent an hour or so walking past large detached houses, my lower-middle-class bungalow-dweller envy-antennae twitching. Some of its citizens were out, performing their Saturday rituals in a mist that seemed to freeze them in place; jogging, football with kids, driving to get the bloated weekend papers. I stalked past, locked in my own hard-to-explain rite, moving from Great to Little Missenden via a dank A-road underpass, thoughts turning towards the vast sunken cities in the works of H. P. Lovecraft and away from the giant houses of these dormitory villages with their hard-to-maintain gutters and weed-threatened gravel paths. I could have headed southwards towards the hotel we were to stay in, but on a whim headed on eastwards towards Amersham. Here, in the Saturday market bookstall, I made my route decision, using the crude bibliomancy of book purchase. As guides to London and Kent were on offer, that is the way I would go – crossing the metropolis and reaching the east coast before bouncing back to Brighton. Buoyed by this decision, I started marching westwards, though horse fields and woods to Chalfont St Giles where I finished. Time now in the last of Autumn to re-read Paradise Lost and start towards winter with a more definite aim. Greetings, anyone stopping by for the first time. The local paper has run a story mentioning my whimsical exploration of ‘Argleton‘, the non-existent town created by Google as an alternative to ‘Aughton’, so it’s possible that some new readers are checking me out. If you’re looking for what I wrote about visiting Argleton , here it is – enjoy! I started this journey at the very beginning of 2008. The idea is to walk in sequential stages, to arrive at my birthplace, Brighton, some time around my 50th birthday in a couple of years’ time. 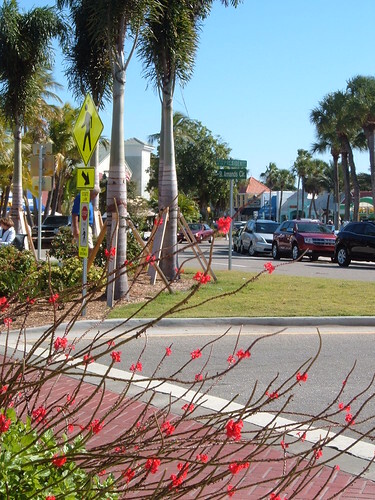 I have walked about once a month, blogging about each part of the journey, with sidetrips and digressions loosely related to the main theme, including a trip to Florida (a place much less real than non-existent Argleton), book reviews and a rediscovered story that I wrote at school. The walk itself started in Southport. I made my way through Maghull and down into Liverpool, used the ferry (my one cheat so far) and walked round the Wirral and down to Chester. 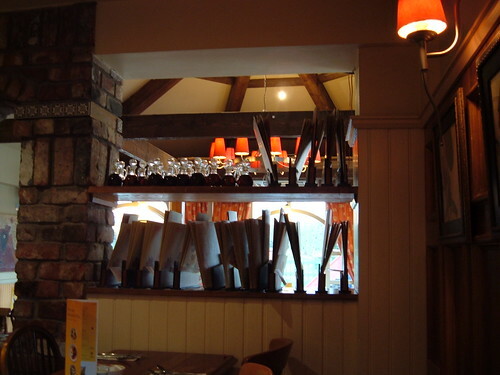 An account of a night in a Premier Inn and its associated pub gets a lot of hits: hopefully my speculation concerning the haunting of reclaimed brickwork is useful to people planning a stay there. After an abortive journey into Shropshire (a county I now see as somewhat uncanny) I wandered through Staffordshire and into the Black Country. 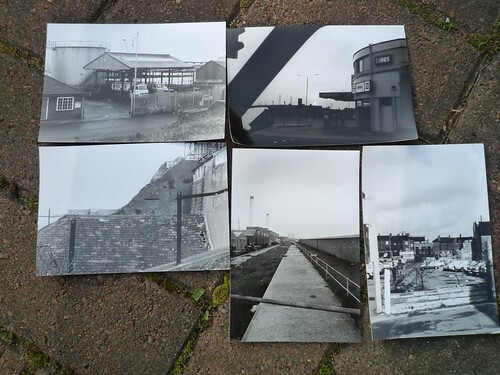 Revisiting places I have lived is part of the plan, hence stops in Wolves, Dudley and Stourbridge. I have now reached a point south of Warwick. I hope to reach Edge Hill battleground soon, the third Edge Hill I will have visited, following trips to the University and the Liverpool district. Why am I doing this? I suppose it’s a way of discovering my own country and my own history; travelling slowly through landacpes usually passed at speed on cars and trains; being part of an international community of walking blogging people; putting one foot in front of the other again and again. …if an inanimate object can indeed ‘reckon itself’. Let me tell you a story. When I was in Junior School (seven or eight years old), there was a competition that involved making a fancy-dress hat at home. So we kids, helped by our parents, made assorted hats from things like card and felt. 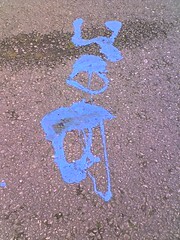 Mine, for instance, was a wizard hat made from a cone of paper with some stars and moons crayoned on to it. All harmless fun for the families. However one of the Dad’s took this on as a serious project, and made a hat that was also a functioning, miniature carousel. Horses rotated and went up and down. It played a tune. It glistened and gleamed. Obviously the embarrassed child beneath this item won, but he had to endure waves of mingled contempt, envy and pity overwhelming a bit of reluctant admiration from the rest of us. Who was his dad anyway? Batman villain, the Mad Hatter? A NASA scientist? I guess we all lost a bit of innocence that day, and I certainly still bear the scars. The iPhone reminds me of that hat – it is too good. My deal with T-Mobile cost £20/month, whereas the cheapest iPhone deal I can see is around the £30 mark. That’s an extra £120 a year, a not inconsiderable sum: enough, for instance, to commission a full re-enactment of De Sade’s ‘120 Days…’ in a Poundland shop (‘Anything You Want – for a Pound’). Don’t they know there’s a recession on? b: buy a Macbook so that the processes involved in getting photos together, blogging etc are more elegant and enjoyable. Advice from owners of such devices welcome.